Quick recap: the Molded Dimensions Team earned best technical paper for their work as the Urethane Restoration Team. The Team sought to find the root cause of the amount of scrap that was being produced each week at Molded Dimensions. We’ve talked about the problem, the strategy, temperature variation and flatness. Today we’ll wrap it all up! Having a cross functional team examine part number after part number, asking many layers of “Why?”, brainstorming root causes, and testing theories allowed Molded Dimensions to slash scrap rates from over 3% to 1.5% over a five year period, and we have sustained those gains for the last three years even with several challenging new projects. The team found true root causes rather than quick fixes. They made changes to nearly every piece of equipment in our urethane manufacturing facility including our presses, hot tables, hot table covers, molds, mixer buckets, vacuum mixers, trimming machines, and our HVAC system. They also changed how we hire people, train new employees, mold parts, measure temperature, prepare material, maintain equipment, and document processes. 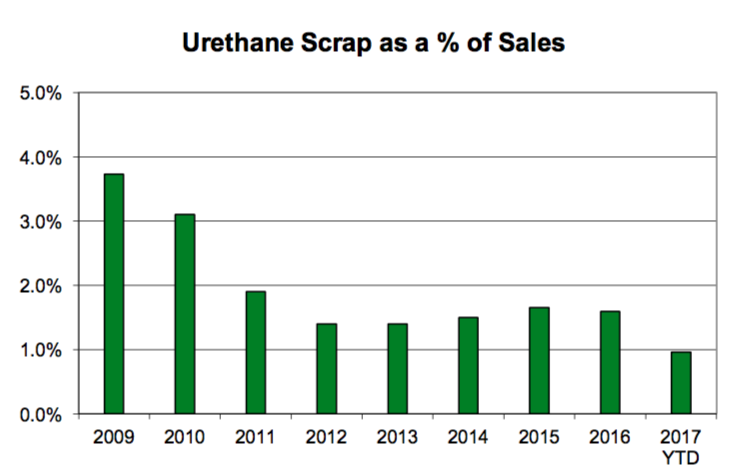 Driving out variation in our equipment and processes has made it physically and mentally much easier to be a urethane molder and set our company up for future success.